I’ve been doing a lot of spring cleaning lately. It’s really given me the chance to get a good look at everything my kids have and make some smart decisions. I’ve donated bags of outgrown clothes, sold some baby toys to a local resale store, put together a stack of books that we’ll donate to the library this summer, and set some items aside for our annual tag sale. 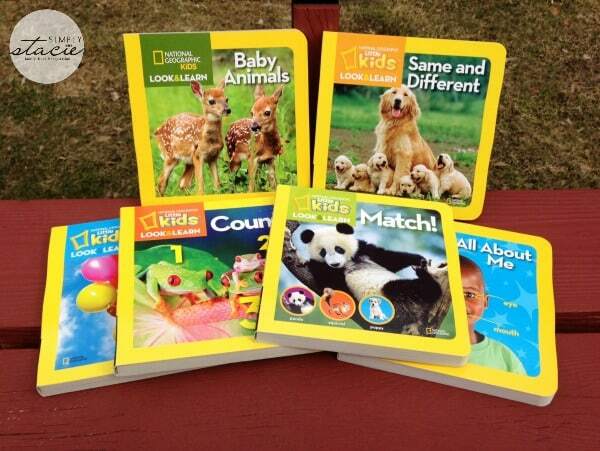 With the old going out, it’s nice to have some room for the new – and we’ve received some neat books from National Geographic Kids that have really refreshed our bookcase with bright colors and new learning concepts. 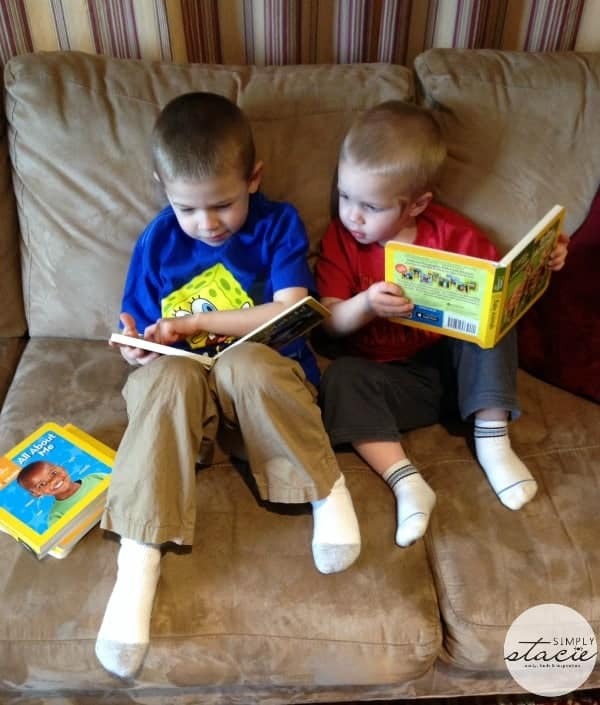 These books are great for preschoolers – there are a lot of bright colors and recognizable images that make the books fun to read. They are also a great size for little hands. What I really like about these books is that they take the basic learning concepts a step further – for example, in the Same and Different book kids are asked to identify which leaf on one of the pages is different from the others, and then they are asked why is that leaf different? And, what makes it the same as the others? In the Count! book, there are neat facts throughout the book that gives kids insight into the objects they’re counting on each page. Did you know that a poison dart frog’s bright colors are a warning to “stay away”? I had no idea! Now I know, and I know exactly what they look like too thanks to the Count! book. Each of these books sells for $6.99 on the National Geographic Shop site and would make wonderful gifts for the young readers in your life. My soon-to-be three-year-old and my five-year-old are both enjoying these books, they find them fun and interesting and I’m happy that the books are reinforcing concepts that they already know and adding new knowledge with new facts and pictures they’ve never seen before. 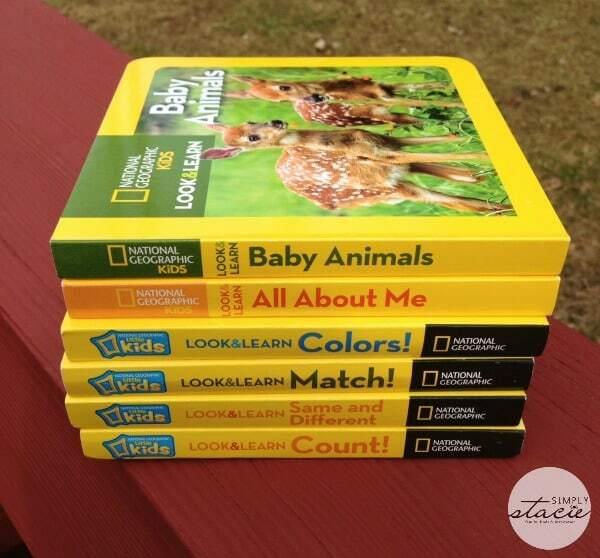 You can learn more about the Look & Learn series of books on the National Geographic Kids site. I like that they have games for the kids on the site. I love that there are a variety of activities for kids to do projects online that are educational and fun for all types of kids! I love National Geographic, and they are doing so many good things to teach us all about the beauty of our great planet. Thank you for the giveaway!! I like the Herb Garden Kit. I like the herb garden kit! I like the Fun Stuff that they have. National Geographic is the best !! Photography rocks ! I like the family mobile memory activity idea. Thanks for the chance. They also sell an herb garden kit..nice. harp seals grow a new fur coat every year. I like the free online kids puzzles. I learned that a physical subscription to the magazine is $15 per year or $12 for the digital issues per year. I like that they have games on their website such as Polar Bear Ice Hockey. I learned that they are having a Pet Video contest. How cool! I like the different activities for kids. I like how interactive their site is for kids with polls, and weird but true facts. The Animal Jam game looks cute. I am sure my daughter would love that. I love the beautiful photography they use in their books!! I like that there is so much information on the site. The Herb Kit is really cool. I learned that it’s another kid friendly website that I can trust for my kids to visit. I had no idea that National Geographic had so many things for kids on their page. I will be visiting it often. I learned that the bottlenose dolphin talks through a series of clicks. One fact I learned is Mother elephants use their trunks to lift newborns to their feet. I learned that a mola (giant ocean sunfish) can weigh as much as 5,000 lbs! Thanks for the cool giveaway. i like the weird but true section. i learned that at a fashion show in Shanghai, China, models wore dresses, hats, and even wigs made of chocolate. My son and I had fun playing Dung Beetle Derby. Thanks for the chance to win this. I learned that they have games for kids!